I called Blippy one of the worst ideas in social media back in Jan., and followed that up in Feb. by listing it as one of the potential dark sides of too much sharing. 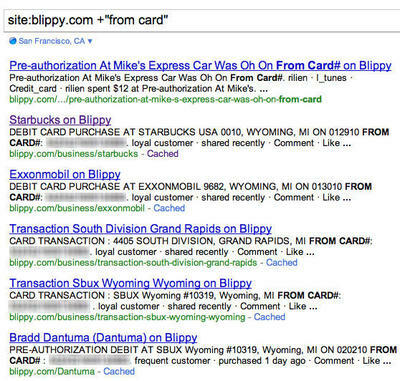 However, I have to admit that even I was shocked by how easy it turned out to be to find out someone’s credit card number on Blippy using Google. The security problem has since been addressed, and Blippy assured people that the problem actually stemmed from the early days of building the site, but does that really matter? A leak happened, and when it comes to things like your credit cards and identity, does any excuse a company give really matter one iota? Can they ever possibly win back the trust of their users? Apparently so many people were deleting their accounts in the wake of the leak that Blippy had to upgrade the deletion system. And that just raises the question of why this site even exists. I have seen some people try to defend its existence by saying it lets them track expenses of employees, or it allows parents to see what their kids are spending, and to that end I say just go to your banking Web site and look at the online bill. There is absolutely no redeeming feature to Blippy that can’t be replicated in a more secure manner by your bank or credit card issuer. The problem is that we are slowly being trained to think all social media is inherently good. If a site is listed as being “social media”, it automatically entices some people to think that it has merit and that they must sign up without a second thought, and if they want information from you, that’s okay because social media is all about bettering mankind. Luckily, or unluckily depending on your point of view, I am an extremely cynical person. I don’t just immediately go, “Oh yay! Another social site has launched, I must join and immediately share all of my most intimate details with the world!” No, I look at each site first, try to judge if it has any potential merit, or if it will in any way make my life easier, and if it doesn’t meet those criteria, I just don’t bother with it. I will admit that I did sign up for a Blippy account, but only so that I could monitor what expected to be one of the stupidest ideas to ever come along. I at no time ever gave it access to any of my credit cards, and my account has no history on it. I looked at more as getting a ring side seat to a train wreck, and, yep, that’s exactly what it was. Sign up for all the social sites you want, goodness knows I belong to enough of them, but always operate under the assumption that someone, somehow, will get into that information. If it isn’t something you want people to know, and a social site depends on that piece of information, then you simply don’t sign up for it. Period. What say you? Did Blippy go to far in wanting credit card numbers?